In Star Trek lore, transporter could move people and objects through space by converting matter into light and then into matter once more. A group of international scientist in the UK have brought such technology a considerable step out of science-fiction to scientific fact. The theory of converting light or photons into matter dates back to the 1930’s but at the time, physicists felt technological limitations would not allow them to prove their hypothesis experimentally. 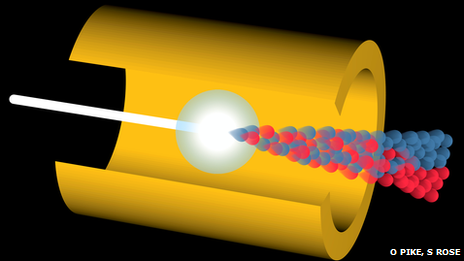 Now, over eighty years later, the UK based team, led by Professor Steve Rose, has found a way to empirically determine that photons smashed together will create electrons and positrons (aka matter). Their design involves using one high powered laser to create a beam of photons and another powerful laser aimed inside a gold hohlraum, a hollow cylindrical device used to create a thermal radiation zone, the second source of photons. Next they direct the photon stream at the photon concentrated zone within the hohlraum and, according to their predictions, the colliding photons should produce electrons and positrons. While not quite transporter technology, it’s a discovery that could progress the physics light-years ahead.